Models of Perception | Graphic Design New York | Clare Ultimo Inc. 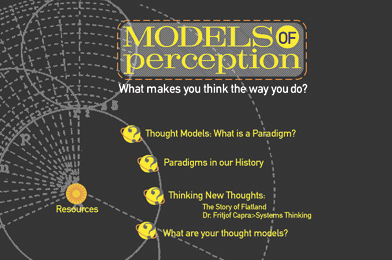 The Models of Perception website developed out of my MFA research paper, "The Crisis of Perception" (based on the work of physicist Fritjov Capra) in order to further explore and create a wider audience for the ideas I was examining. In the website, I was also trying to "loosen up the idea" – to make it more inviting to a layman. In this interactive medium, I could further enlarge, expand and begin to clarify how paradigms and thought models "work" in our lives. I found that at the root of our presumptions about almost everything is an older model of science (Cartesian and Newtonian) and this model has really been changing since the 20th century dawn of quantum mechanics. While these ideas are slowly becoming more discussed in the mainstream, I believe a new model of perception is in the making. We're on the verge of a serious paradigm shift in the way that we "see" our world, with some very bold and brave scientists leading the way. The idea of "Flatland", written in 1884 by Edwin A. Abbott is animated on the Models site and can be found on "Thinking New Thoughts">The Story of Flatland". This simple story illustrates the difficulties we may have with expanding our vision and perception of reality. To read the accompanying research paper, "The Crisis of Perception", please click here. 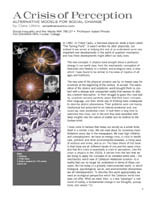 To read the accompanying research paper, the "Crisis of Perception", please click here.